This plan of Lima, the capital of the Viceroyalty of Peru, was created to celebrate the completion of a massive fortified wall around the city, which offered protection against attacks by foreign pirates. This map served as the source for a later, and well-published image of Lima. Walls like the one surrounding Lima, with projecting battlements, were the principal method used in Spanish America to protect vulnerable coastal cities. Near the edge of the city walls, the densely packed city gave way to ordered orchards and gardens. Within the city, wealthier citizens lived closer to the main square. But they typically rented out street-front rooms of their urban palaces to small merchants, who lived in lofts above their stores. Thus urban spaces were often quite socially diverse. One of the largest compounds on the map is the monastery of San Francisco. Food for the monastic community was grown in the walled gardens in the back. While the city is filled with buildings, people are entirely absent. But at the time this work was made, Lima was a multi-ethnic city, with a large black population. Black, indian, mestizo and mulatto laborers were responsible for major public works projects, like the city fortifications. The legend at the bottom of the map attributes the construction of the wall to Melchor de Navarra y Rocafull, Duque de la Palata, and príncipe de Massa, who served as Viceroy of Peru from 1681-1689. On either side are lists of the churches, government buildings, monasteries, convents, schools, and hospitals in the city, an indication of Lima’s wealth, and the vibrancy of its collective enterprises. At the bottom of the legend, Pedro Nolasco Meré, a French Mercedarian, takes credit for the creation of this map. Juan Ramón Koninick, a Jesuit from Flanders working in Lima, drew up a plan for a set of fortifications around the city in 1685. 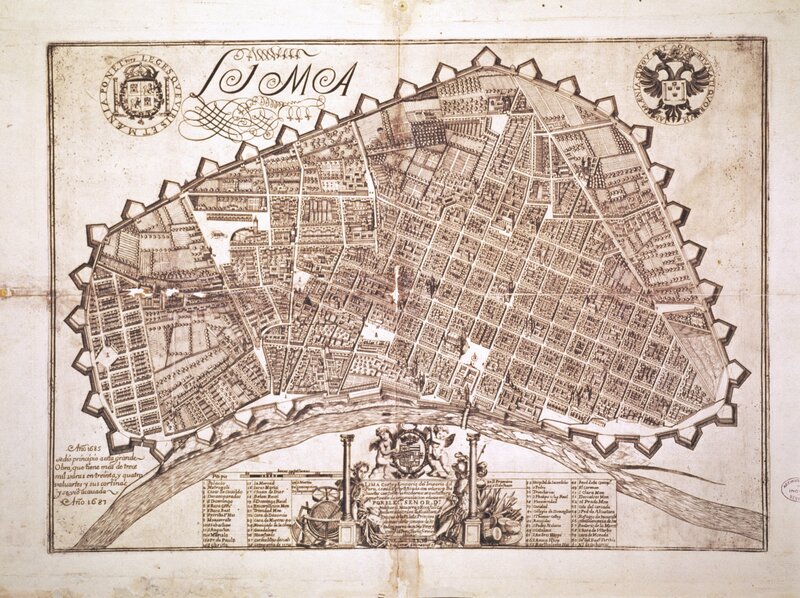 Once the energetic viceroy had the walls completed, Pedro Nolasco Meré, a French Mercedarian, also in Lima, used Koninick’s drafts to create this elaborate map of the city, showing its finished walls. The map is a copperplate engraving, one of the most common techniques used in the 18th century to make multiple copies of a work. The print measures ca. 45 x 64 cm (ca. 18 x 25 inches), and seems to have been designed as a stand-alone, single sheet view of the city. And while the printer could have easily created thousands of images from a single plate, very few copies of this map are known. This print is currently in the Archivo General de Indias, in Seville, which is the main Spanish repository for government documents dealing with New World colonies, where it was probably sent to help inform the Spanish government of the extend of the finished product. 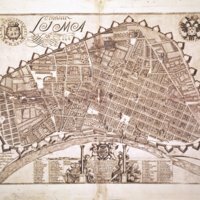 In the order of its streets, the density of the urban fabric, and in the number of its religious buildings, this map of Lima carried an important message about its urban order to the heart of the Spanish government. And print technology meant that this map, or copies drawn from it, could also reach a large European public. Durán Montero, M.A. 1994. Lima en el siglo XVII: arquitectura, urbanismo y vida cotidiana. Seville: Disputación Provincial. Lohmann Villena, Guillermo. 1964. Las defensas militares de Lima y Callao. Seville: Escuela de Estudios Hispano-Americanos. Walker, Charles. 2003. “The Upper Classes and Their Upper Stories: Architecture and the Aftermath of the Lima Earthquake of 1746.” Hispanic American Historical Review 83 (1): 53-82.